Now groovy Bratz style can be your bedroom style with Bratz bedding. Funky lavender and aqua bedding features a retro flower design and 4 favorite Bratz characters. In PJs and robes, this fun bunch is ready to talk hair, makeup and musicall the serious slumber party topics. Flat sheet and comforter have Bratz inscription in trademark cool font. Add to this hip ensemble with the plush pillowa soft, heart-shaped teal pillow with a faux-fur lavender trim and glittery Bratz. Slumber party fun starts with the Bratz gang. This twin Bratz comforter is cool aqua with a lavender and blue retro flower design, plus 4 of the favorite Bratz girls. They're kickin' back in their jammies, ready to talk makeup, hair and musicall serious slumber party topics. Comforter has a lavender trim and reads Bratz; back side is lavender with aqua flower design. Coordinate with the Bratz Twin Sheet Set and Plush Pillow (each sold separately). Polyester/cotton. Your little fashion diva can create a funky fashion look that she and Yasmin, her very own Bratz girl, can wear again and again. Brunette Bratz Yasmin comes with everything to keep them both looking beautiful. 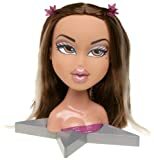 Includes beauty gel, 3 containers of colored glitter for hair, body and face, removable hair extensions and 2 clips, star-shaped hairbrush, 2 applicators and powder puff. Mix the gel and glitter to create real makeup. Ages 4 and up. Imported. This Wintertime Collection Bratz Sasha doll is sporting the hottest fashions of the season. Ready for some winter fun, she has a mix-and-match wardrobe of 2 jackets, 2 tops, 2 bottoms, 2 pairs of boots and 2 totally cool Bratzpacks. Add the final touch with 10 wintertime accessories, including an exclusive "Xtreme" sports snow disc. 10H". This Winter Collection Bratz Jade doll is ready for some winter fun. Featuring the hottest fashions of the season, Bratz Jade has a mix-and-match winter wardrobe of 2 jackets, 2 tops, 2 bottoms, 2 pairs of boots and 2 totally cool Bratzpacks. Add the final touch with 10 wintertime accessories, including an exclusive "Xtreme" sports sled. 10H".